Custom Case Group (CCG) can engineer just about any case. We provide reusable cases from Pelican, Anvil, Zarges, and Wilson, with offices throughout the US -- Engineered Packaging Solutions in the West, and SCS Cases in the Midwest and East. CCG engineers specialize in custom die-cut, waterjet-cut, CNC-routed and fabricated foam interiors for rackmount, carrying and shipping cases. Other interior customizations include brackets, racks, drawers, guitar hangars, trays, nets, straps, shock-mounting, dividers, and interior case ramps. Exterior customizations include hardware, routings/holes, forklift skids, graphic wraps, locks, powder coating, recessed telescoping handles, EMI/RF shielding, I/O panels, reinforcements, labels/logos and wheels/casters. We work in the aerospace, equipment, fire/rescue, hazmat, industrial, medical, military, OEM, oil and gas, shipping, and trade show industries. 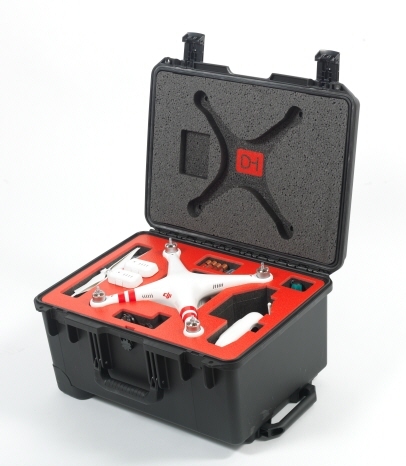 We also feature DroneHangar, a line of custom cases for drones and UAV/unmanned vehicles. Our clients include Microsoft, Boeing and the US Military.